You are here: Home / Getting Started / Considering Home Schooling? Undertaking home schooling is a major decision that needs to be carefully considered. Not only will you become the primary educator, you will also be the school district, administrator, supplier, coach, and much more. Here are some questions you may be asking. Yes, it is legal. Home schools in Texas are private schools for the purpose of compulsory attendance, and, as such, students attending them are exempt from compulsory school attendance laws. The only requirements in the state of Texas are that you pursue in a bona fide manner a basic curriculum of reading, spelling, grammar, mathematics, and a study in good citizenship. 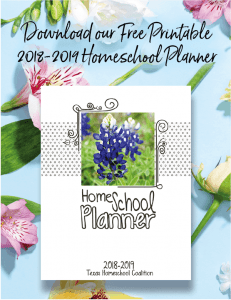 Learn more about homeschooling in Texas. Many parents wonder, if they home school their children, will they be ruining them for life, will the children be able to get into college, will they be “normal,” etc. Although home schooling is not a panacea, and it is not for everyone, many families find that their children not only survive homeschooling but thrive. How can I successfully teach my own children if I have not been trained? A vast variety of curricula options and resources are available, including curriculum that takes on a step-by-step instructional approach, curriculum types that require intensive parental preparation, DVD or computer-based programs that require parental supervision with very little preparation, and many other styles created to meet your needs as an educator. What about activities and socialization? Most home schooling families have discovered that the freedom and support of other home schoolers around them has given them a wealth of opportunities for meeting this need and that they are often hard-pressed to make choices on what activities to exclude. Home schoolers have many opportunities to socialize with varying age groups through local support, co-op, and church groups; sports groups and leagues; 4-H; extracurricular activities; volunteer opportunities; and more. Home schoolers tend to be better prepared socially compared to students who are limited to a classroom setting 180 days each year with peers of the same age group. At THSC we facilitate this by offering a number of terrific resources for learning about events and opportunities and help get you connected with groups in your own area. Texas leads the nation in the number of home schooling families. How does THSC support home schoolers in Texas? In addition to that already mentioned, as a member of THSC Association you receive free legal assistance for issues related to home education and access to resources for children with special needs. You also receive the latest news regarding home schooling in Texas, current parental rights issues, our dealings with state and local officials, and much more. Ready to begin? Try our 7 Steps to Begin. Still have questions? Visit our Frequently Asked Questions.